Coming up next week is a fund raiser for the Let's Read charity campaign from Dar Al Atta. Essentially the Let's Read campaign is all about providing books and reading opportunities to those less fortunate here in Oman, I've been a fan for some time now. 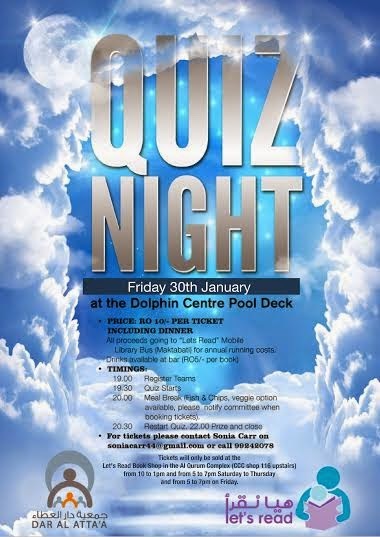 It's a quiz held at the Costain Club Dolphin centre pool deck. Essentially a pub quiz without calling it one. Entry into the quiz and dinner (fish & chips or rabbit food) is a tenner (RO 10) and this will also go to help fund their charitable projects. The fun starts at 7pm with the quiz commencing at 8pm, and ending at 10pm, where the winners and their prizes will be united. If you and your mates think you're cleverer than most, get in touch with Sonia Carr on soniacarr44@gmail.com or alternatively head down to the recently opened Let's Read book shop in the CCC Al Qurum Complex (upstairs) between 10am and 1pm or 5pm and 7pm Saturday to Thursday.